In case you were worried that you may have offended the voice-over person in your life by not wishing them a ‘Merry Voxmas’, fear not, that’s not what you did that offended them. Going to Fiver and hiring a squeaky voiced teenager to narrated your corporate video was what offended them. 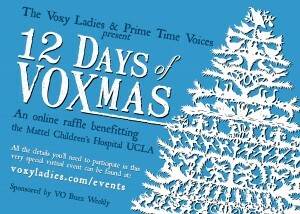 The 12 Days of Voxmas is a made up thing to help raise money for the Mattel Children’s Hospital at UCLA. A bunch of LA voice talents (and some not in LA I believe) made a CD and the proceeds from the sale benefit the hospital. The Voxy Ladies of which I am not one created a raffle that will allow you win prizes if you enter your receipt from the purchase of the CD into their raffle. The VoxStars of which I am one is supporting the 12 Days of Voxmas by contributing a microphone. So buy the CD and get a chance to win either a microphone or other cool stuff. So David W. Stone calls me and says he heard from Lisa Biggs who said my application to be a Voxy Lady was denied for “privates” reasons but she would not elaborate. But he said I could be a Vox Star. So I said sure. While noting the Voxy Ladies and Lisa’s great efforts there are part of the foundation upon which this idea was born (I laugh so hard when I hear people who have underestimated that woman) the VoxStars will evolve into its own identity. The VoxStars is a collective of professional voice talents (seems to be an all boys club thus far) who are coming together primarily as another marketing vehicle to create awareness for our work as well as use our talents nationally and regionally to support our communities. As with most everything, I look forward to enjoying the ride.